Comments: I usually don't write these reviews, but after finding FileCenter I feel I need to help spread the word about this great software product. If you run a small office, you should at least give FileCenter a try. It will make dealing with the daily flows of computer and paper files much easier, and your office staff will love you for it. FileCenter has a lot to offer in the paperless context. We primarily use it to manage our computer files, but it also has very robust scanning, PDF editing, and search features. In the manage context, all you do is "map" a folder location already on your network or local drive to a FileCenter "Cabinet", and it very cleverly displays your files in a Cabinet/Drawer/Folder paradigm just like a paper filing cabinet. This makes it much more intuitive than the traditional Windows Explorer, but all your data is still on the file system. So even if you removed FileCenter from your computer, your data is still there and accessible like it was before. As such, I strongly recommend a file system based approach to document management for this very reason. I've made the mistake of going with a database drive system with my last software and had a hard time getting my data out of the system when I switched software. While the likelihood of my switching from FileCenter is rare, there are so many more benefits to a file system based approach when it comes to document management, especially for small offices like me. Also, the customer support for FileCenter was very positive. They actually get back to you in a timely manner and have a good grasp of how to run an effective paperless office. They were able to give me a lot of good tips and best practices in working with FileCenter. Lastly, you really need to check out FileCenter's video library. It has a number of how-to videos on most of the primary features of the program that makes getting up to speed with FileCenter easy. I have found this to be an invaluable resource. Like I said before, I usually don't feel compelled to write these reviews but given the increased productivity FileCenter has given my office, I felt it was the least I could do to repay my gratitude to the makers of FileCenter. It's definitely worth your taking a closer look if you want a solid document management program. Pros: This software has a very quick learning curve. I had to teach it to an employee, and it takes no time at all. It's easy to set up cabinets, folders and files and access them. I like the feature that allows you to send an email with password protection. Very easy to do. I scan all our documents for our accounting firm which includes tax returns and financial statements for our bookkeeping and retainer clients. Overall: I find that I need to password protect FileCenter and the pdf's that I am emailing. We are constantly reminded from IRS that we must protect our computers and our software. I am so happy that FileCenter has these features. Pros: The software is so easy to set up and start using. I love the fact that I can set up templates for my folder structures as well as my file names so that we can all be consistent in our office when naming files. The OCR module is included in the package of software, as well as the ability to edit files. These two features alone is worth the investment. 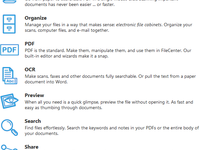 Overall: I have been extremely happy with my purchase of FileCenter Document Management. I use the software for my credit repair business. It makes my life so much easier when going to look for my files or even to store them by scanning or printing. I have contacted their support department a couple of times and they had a great response time and were able to answer my questions. Recommendations to other buyers: The staff at Lucion is great to work with. They have a great support team, and a great consulting team that really helped us move forward quickly with setting up the software so it would work best with our company model. We are glad to have been able to help you out Jim. Thanks for being a customer and giving us the opportunity to serve you. Helped me manage and organize files, saves me space and paper, it's a delight! 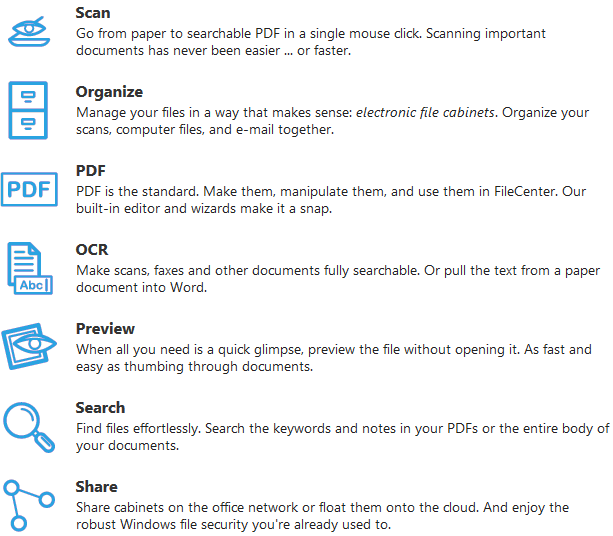 Pros: My 2 favorite features, among so many, are the file preview, where you can browse any file without opening and the print to pdf, feature, where you can take any web page, word document or email and turn it into an accurate pdf file. Cons: There are so many functionalities with this, that it is hard to say anything negative about it, I absolutely love it! You may think it's a little expensive, however, when you see the amount of time, space and paper that you save, it's more than worth it. You have to ask yourself, how much does a new filing cabinet cost for the added files that you have accumulated. Overall: Save time browsing files without having to open them, save space by storing files on my computer, save money by buying less paper, not to mention the environment. Comments: I had been using another product previous to FileCenter, but the cost became to great to stay with them. After taking some time to search for a suitable replacement, I found FileCenter. Initially, I started by using the FileCenter Standard product at home to become familiar with it. I had wanted a home version of my previous software, but they were $40 a month/user and FileCenter was $50 one time for their standard version and $200 per user, one time for my business. After using the software for a couple weeks I was convinced to use FileCenter for my business as well. The things I love about this product is the simplicity. It took me some time to learn my last software and they wanted to charge me a lot of money to implement it for me. I installed FileCenter within 5 minutes and had my data imported into the software within 10 minutes. FileCenter has thought of everything and have great videos available online for me to view at any time. There was one time that I needed some help getting my Plustek scanner working with their software and I received a quick response from them with detailed instructions on how to get my scanner working. The review given on this site by Capterra doesn't give you all the features that are available on the software as it seems like they only reviewed the standard version. You can print to PDF directly into the software, as well as Version Control. I can also assemble documents in my software, but I am not sure how Capterra defines this feature. I also love the fact that I can have a file cabinet set up to integrate with my Dropbox and OneDrive accounts. This is great because then I can have the same cabinet set up on my home computer or vice versa. This is for the Professional edition of our FileCenter product. Does what other could not, awesome powerful application for user at all levels. Pros: Easy manipulation of large network folder structure. No need to install sql server as competitor software required. Customization for large user group or individuals. Updates can break connections with third party software. Overall: This was the only software solution that could be found that did not require another sql server instance to be installed. Our many reason for purchase was to have an easier solution to archive company records. Very easy user interface. We use this primarily to manipulate scanned documents to an archive server. This makes it very easy for a user to 'know" exactly where they are on the network. Cons: At the firsth touch you may have some difficults to reach all the functions. Overall: We use FileCenter to scan ad organize all the paper of our shop: orders, bills, drawings ... everything in one stable and well engineered software. Before we use Papermaster ... FileCenter is better. I love using FileCenter. It has helped organize our business and makes scanning documents a breeze! Pros: I love the ease of the scan feature. Being able to append and prepend documents without any fuss. Also being able to edit a scanned document is another of my favorite features. Cons: There have been some instances where the software freezes up while trying to communicate with windows explorer. Pros: My office uses this software everyday. We scan and archive everything with file center. Very easy to use and has given my employees no problems at all. Cons: None at the moment. My workers have had no issues and seem to like this product. Overall: I used to use Paperport but switched to FileCenter. This program is superior in every way to Paperport and has more features. I use it everyday and I am very satisfied with the results. I recommend this program. Recommendations to other buyers: If you need scanning software, look no further. Overall: We love the software, especially for the price. It is easy to use, easy to set up , but packed full of features. We have used another electronic document management software, at a much higher price, but we have even more features with the more expensive software. Pros: This software is easy to use and increases your production rate. All the right tools integrated into product. Cons: Could use a better tool for creating and filling forms. The typewriter function is a little awkward to use. Overall: The program is very versatile as well as user friendly. There are more functions than I need, but reduces to simple for me. The Support that i received from Kevin Anderson, was exceptional. He was knowledgeable, and patient with me. My problem was immediately resolved. This is a winner. Recommendations to other buyers: It is exactly what i wanted. Pros: When it is functioning like it is supposed to it it great. We do a lot of scanning into and emailing out of this program and when it doesn't crash it works fine. Cons: 5-6 months after we bought File Center 9, File Center 10 was released. After 10 was released we started having issues with crashing and scanning. I reached out to tech support and they let me know that will not be supporting File Center 9 any more and told me I need to purchse Filecenter 10 for all the PC's that we are running to "possibly" fix the issue. This company is terrible I can't get support for a product I purchased multiple copies of less than a year ago without spending 100's of dollars with them again. The worst thing is they can't even guarantee upgrading will fix my problems. Do not buy this companies product. Pros: Ease of use, clean interface, conversion ability and viewer. It's fast as well. Overall: I've been using FileCenter for many years now. It just keeps improving. The program is fast and powerful. Makes working with documents extremely efficient. For anyone that works with a large number of files, regardless of the type, this program is a must! Support is also rock solid. They care about their product and work quickly to resolve. This software is the best bang out there, I should know. Cons: I didn't start with this software and wish I had them originally. Overall: I've been paperless for over 12 years, I have used several different companies software and this is the ideal paperless solution. Besides the ability to start using immediately, it has all the functionality I've seen with other companies plus some! I had a technical issue that ended up being in house (on our end) but the support we received was tremendous. Comments: I sent in a request to Filecentre Support asking how to create a transparent signature. I was very impressed at the step by step instructions I received which were so well explained and easy to follow. I now have a transparent signature. I had been using a white background signature for years. Comments: Great, reasonably priced alternative to some other electronic document management software solutions.